Location: Poland, an East Central European nation, borders six countries: Germany, Czech Republic, Slovakia, Ukraine, Belarus, Lithuania, and a Russian exclave, Kaliningrad Oblast. Its Baltic Sea coast spans 328 miles. See a map of Poland for more geographical information. Capital: Warsaw (Warszawa), population = 1,716,855. Currency: Złoty (PLN), pronounced "zwoty" with a short o. View Polish coins and Polish banknotes. Time Zone: Central European Time (CET) and CEST during summer. Language and Alphabet: The Poles have their own language, Polish, which uses the Latin alphabet with a few extra letters, namely the letter ł, pronounced like the English w. Thus, kiełbasa is not pronounced "keel-basa," but "kew-basa." Locals usually also know a little German, English, or Russian. German will be more readily understood in the west and Russian more in the east. Religion: The Poles are devoutly religious with almost 90% of the population identifying themselves as Roman Catholic. To most Poles, being Polish is synonymous with being Roman Catholic. 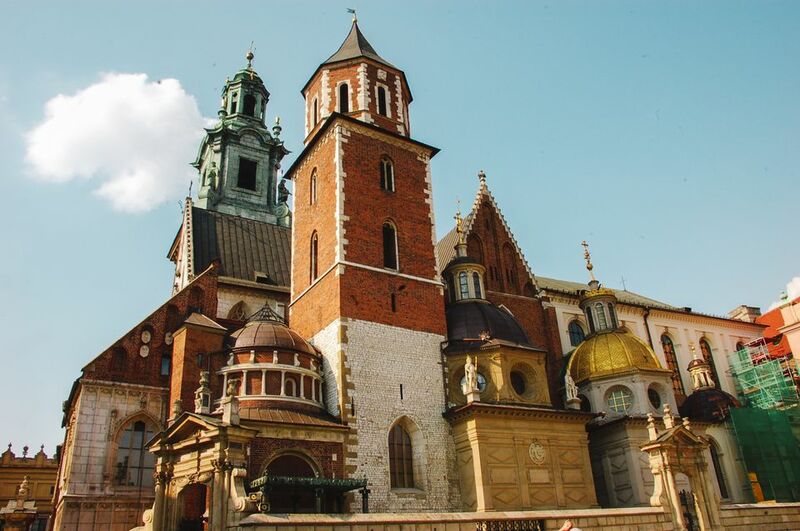 Krakow: Krakow is Poland's top destination city and enjoys a rich cultural calendar as well as a sprawling historic center that is known for its beauty and activity. Krakow has a large student population, which helps the city maintain a youthful vibe. Learn more about Krakow's must-see sights to decide what you can't miss. Old Town Warsaw: Old Town Warsaw was resurrected from the ashes of WWII due to the enduring spirit of its community, which rebuilt it brick by brick. This World Heritage Site is a testament to Warsovian's undefeated pride in their home city. Poland's Black Madonna: The Black Madonna of Czestochowa is the country's most important holy relic and the impetus for regular pilgrimages to the monastery that keeps it safe. The icon itself is small, but its reported powers are great. Visa Information: Citizens from many countries, including the US, can enter Poland with only a passport. Visas are required if visitors intend to stay longer than 90 days. Three exceptions are Russia, Belarus, and Ukraine; citizens from these countries require a visa for all visits to Poland. Airports: Tourists will probably use one of three airports: Gdańsk Lech Wałęsa Airport (GDN), John Paul II International Airport Kraków-Balice (KRK), or Warsaw Chopin Airport (WAW). The airport in Warsaw is the busiest and is located in the capital, where train and plane connections to other cities are plentiful. Trains: Polish rail travel is not at the standard with the rest of Europe, but it is developing. Despite this issue, train travel in Poland remains a good option for travelers who want to see several cities during their stay. An express train trip from Krakow to Gdansk via Warsaw takes about 8 hours, so travel time should be factored into any stay in Poland if train travel will be utilized. Lengthier and potentially less comfortable rail travel is available when connecting with international cities. The trains with a bad reputation are the night-trains between Prague and some other tourist destinations. Try to avoid the six-person couchettes and get a private sleeper car with a lock. Ports: Passenger ferries connect Poland to Scandinavia all along the coast. Transport specifically to and from Gdańsk is served by the company Polferries. History: Poland first became a unified entity in the 10th century and was ruled by a series of kings. From the 14th to the 18th centuries, Poland and neighboring Lithuania were politically united. The constitution established in the late 18th century is a monumental event in European history. The next hundred years saw a Poland divided by those who would control its territory, but Poland was reconstituted during WWI. Poland was heavily affected by WWII, and today it's possible to visit some of the Nazi camps established there for the purpose of mass extermination of groups of unfavorable individuals, including Jews, Roma, and the disabled. In the 20th century, a communist regime with close ties to Moscow ruled until the 1990s, when communism's collapse reverberated through East and East Central Europe. Culture: Polish culture is one of the countries largest draws. From food to handcrafted gifts to Polish folk costumes to annual holidays in Poland, this country delights every sense with its rich traditions. View Poland's culture in photos.